+31°C (87°F) and we’re melting away here on the northern coast. It’s too hot to do anything much but a bit of Rally training in the garden works fine, as long as we return to the shade quickly afterwards. 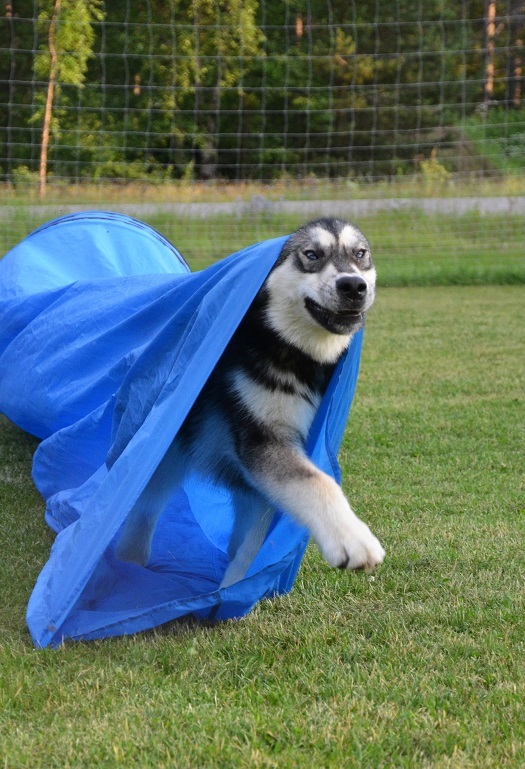 We haven’t trained Rally-O since November last year so yesterday’s session was a bit rocky. 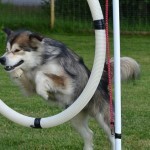 Still, it is fun to see how much the dogs remember, especially Wilder who has only tried his paws at this sport once or twice before. What’s so great about Rally is that you are permitted to talk, praise and encourage your dog, and use unlimited commands and hand signals. Rally is a positive sport in many ways and a great option for those who dislike the stuffiness of formal obedience. 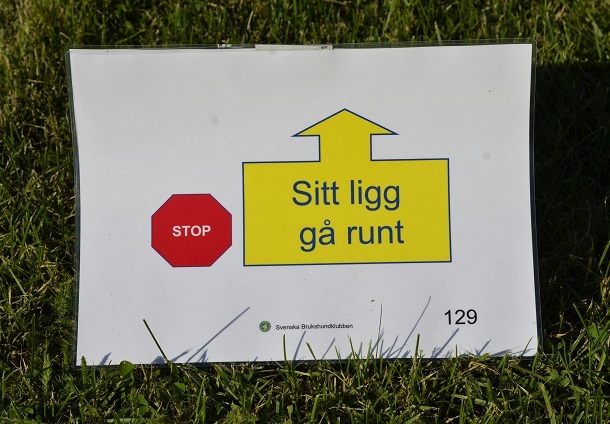 We have printed and laminated all the Novice Rally signs so we can use them for training in any weather. If you want to buy SBK’s signs for Novice class in soft plastic, you find them here. 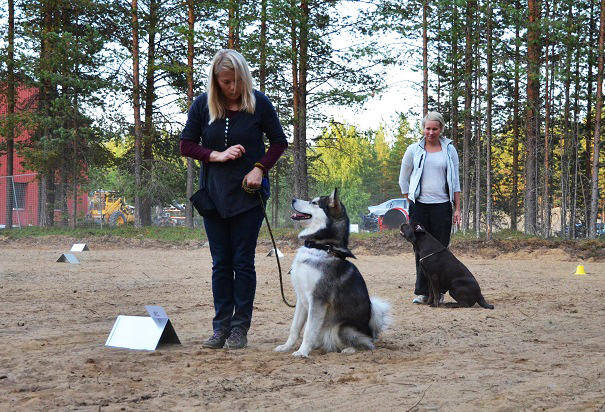 According to Swedish Rally regulations, you are not allowed to use treats or toys in the ring but we do of course use plenty of rewards during training. 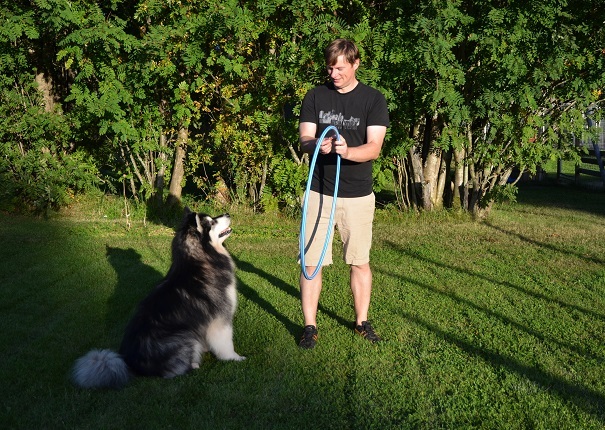 I do my best to avoid using the leash to steer the dog in position, as in rally points are deducted every time the leash is tight (in the more advanced classes the dog is working off leash). 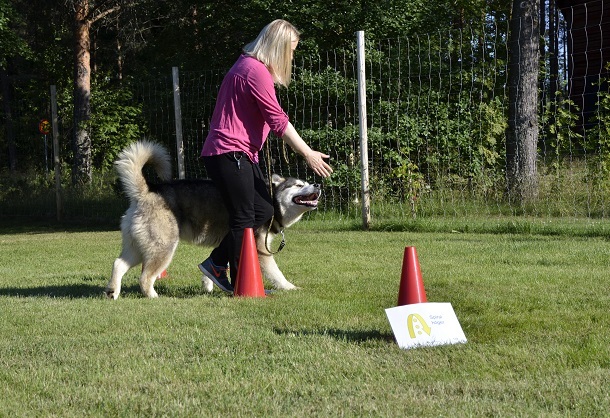 However, I sometimes forget about the leash and that’s why it’s good to film your training sessions, so that you can spot mistakes and correct them. 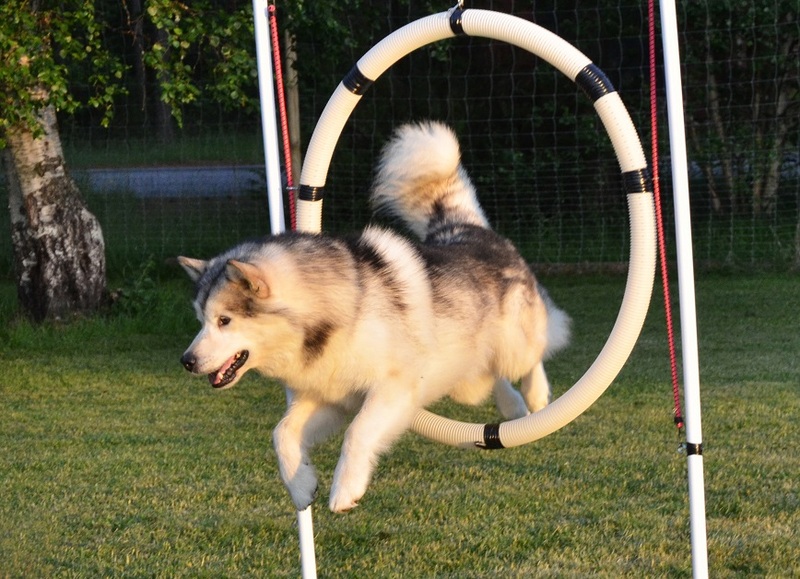 Below is a video with some clips of me training with Lyra and Wilder. Btw, you won’t recognise Wilder as he barely has a hair on his body. At least he’s dressed for the weather! 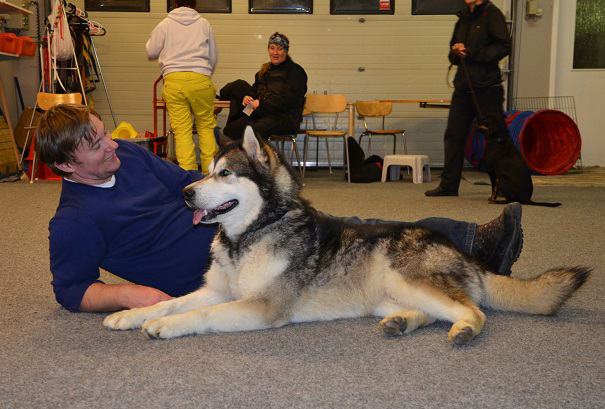 After yesterday’s session I know that there are several areas that need improvement; we need to improve our sits, as they are often more than 45 degrees out of heel position, improve call fronts, and our turns are too sloppy. 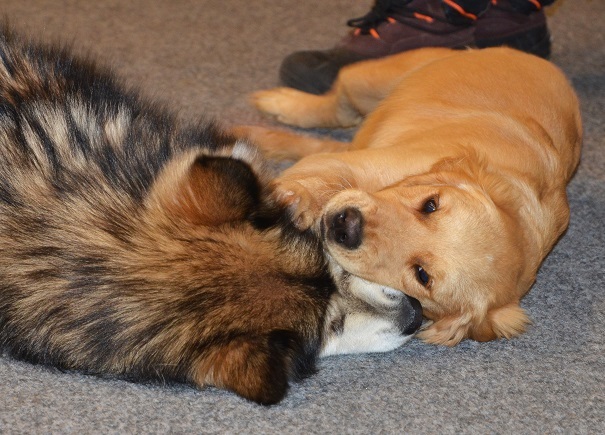 I also need to improve Wilder’s heelwork, as he is often crowding me. Well, there are many areas that need improving but hey, that’s what training is all about! In my last post I promised to take some new pics of Leia but decided that a video would be even better! 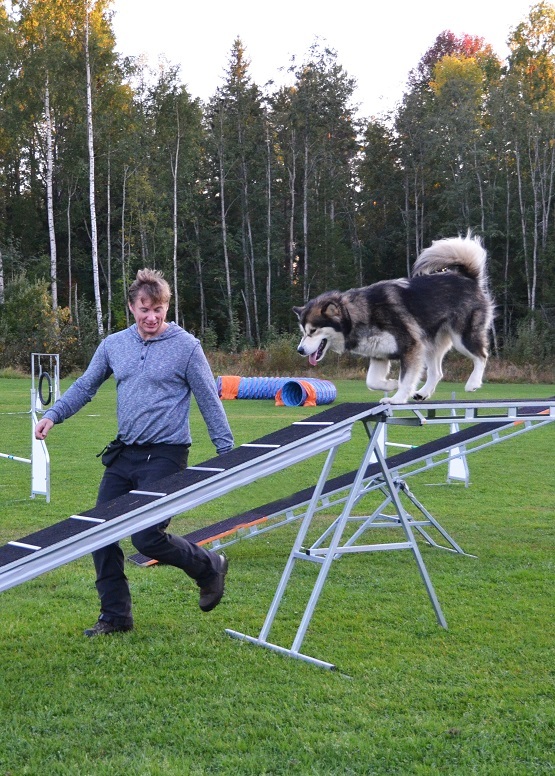 In the video below you can watch her having fun on the agility course last weekend. 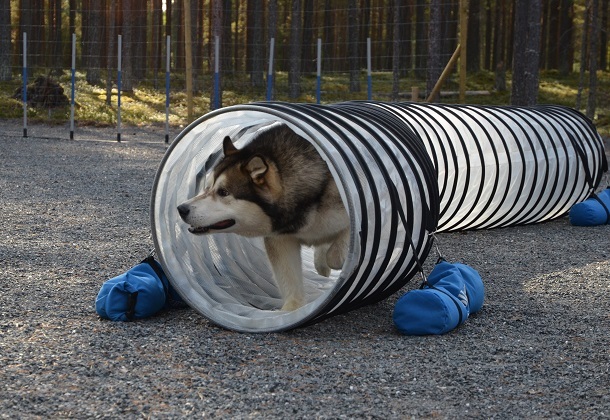 We decided to end the agility year 2013 with a private training session at the superb facilities offered by Hundvis in Piteå. Three hours of fun together with Leia and Hilary (including a brief “try-on” session with Wilder) – what better way to spend a Saturday night?! 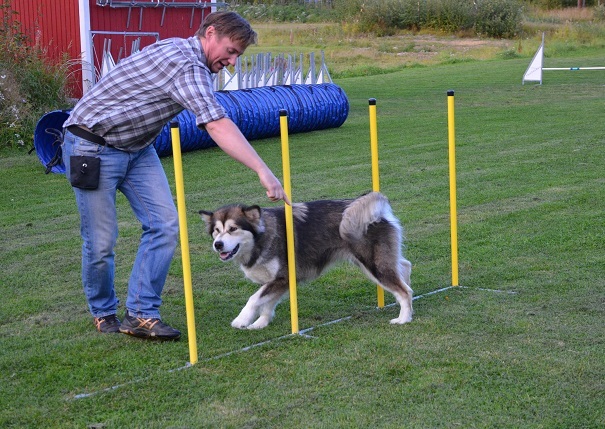 This year we have mainly been training agility in the company of other dogs at the club and while group classes are both fun and necessary, private training offers a quieter environment which makes it easier for both dog and handler to focus on the task. We will continue with group classes during next year but will make sure to book in some private training sessions too. 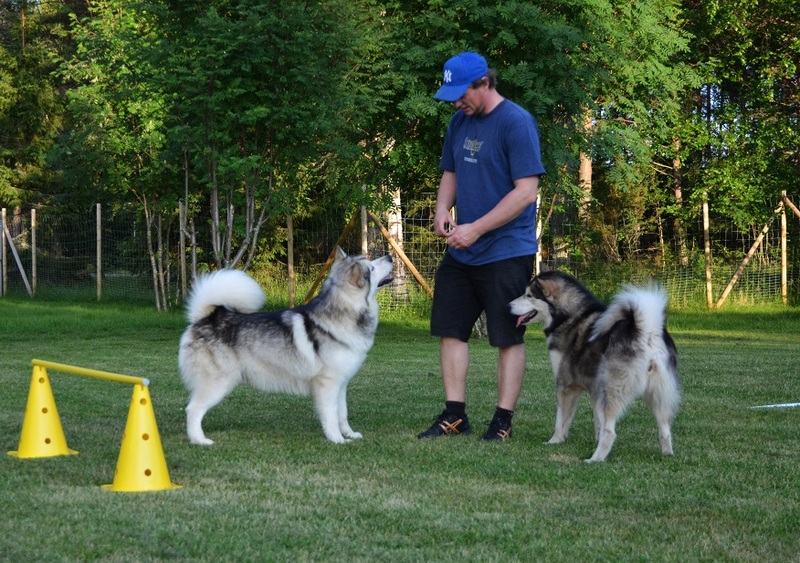 While we train agility with all our dogs during the summer, during the rest of the year we spend a litte extra time on Leia, Hilary and Wilder as they show most interest in this sport. 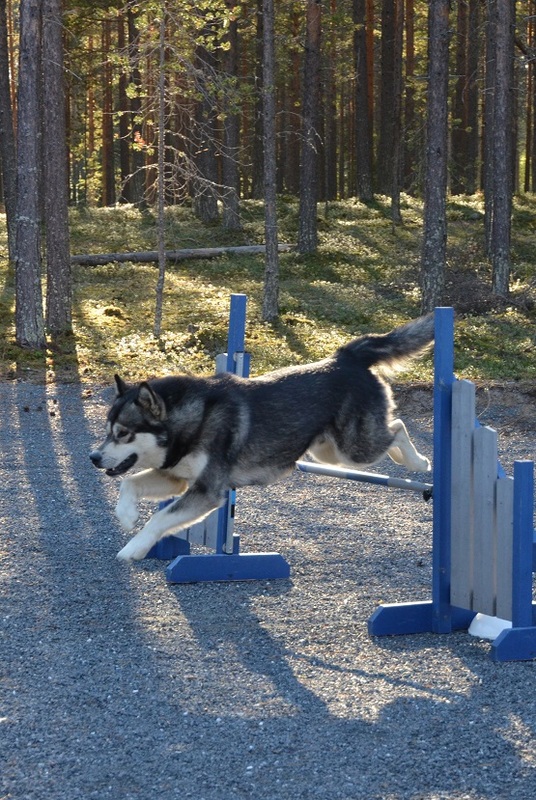 During Wilder’s first year we have introduced him to the different obstacles but have only involved him in training a handful of times so far. 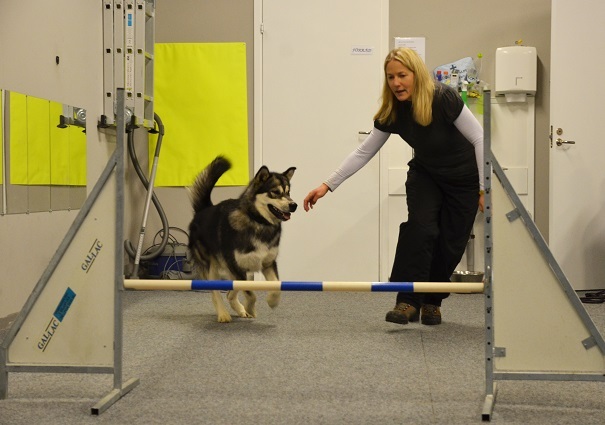 Until he is two years old we will focus on handling, communication, body awareness, distance work, and on the obstacles that are not so physically straining. 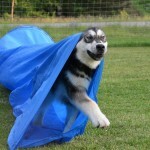 Wilder’s rally training has given him a solid “stay” which will be an advantage in agility. 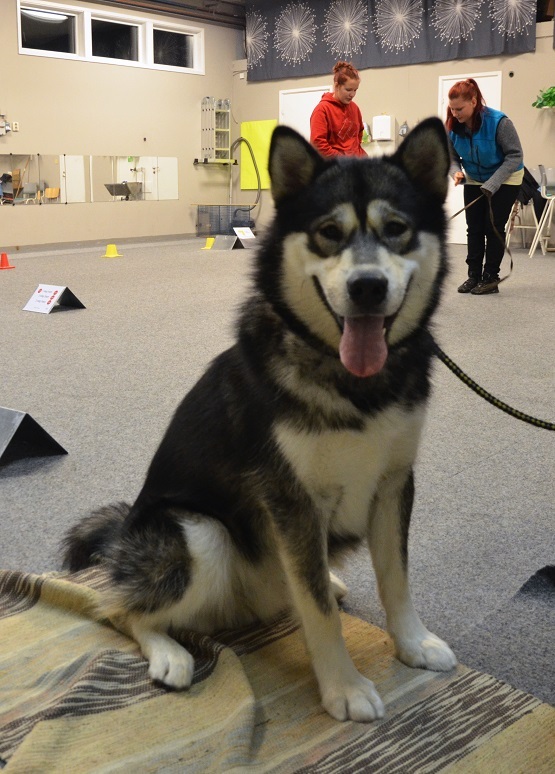 We look forward to his beginner’s class which starts in January! 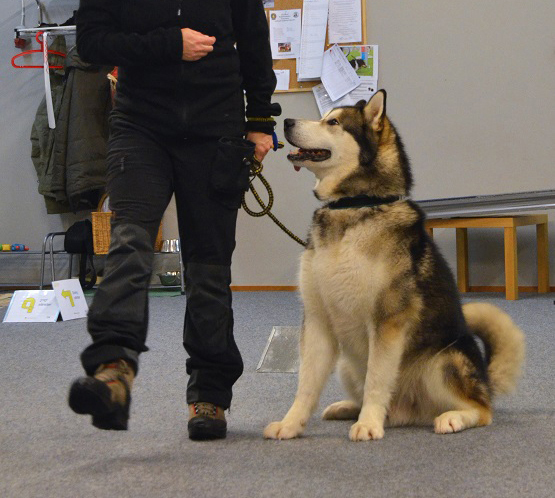 Hilary and Fredrik will continue with their weekly training during 2014, indoors until the end of May and outdoors during summer and fall. 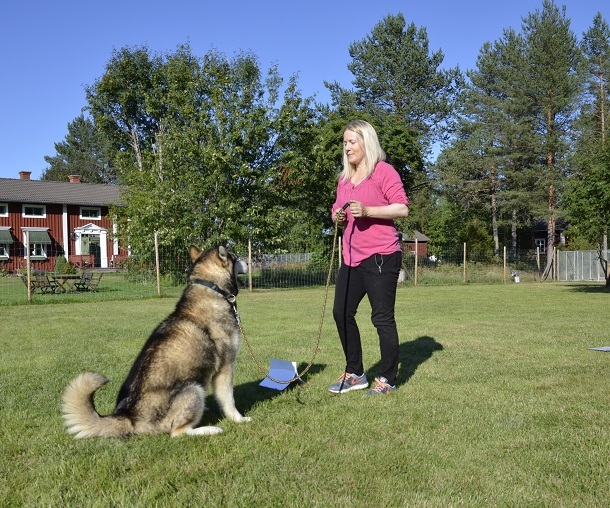 Fredrik hopes to take some handling classes to improve teamwork and communication and will also focus on improving Hilary’s basic obedience by attending plenty of group classes (she still likes to run off to say hello to other dogs!). 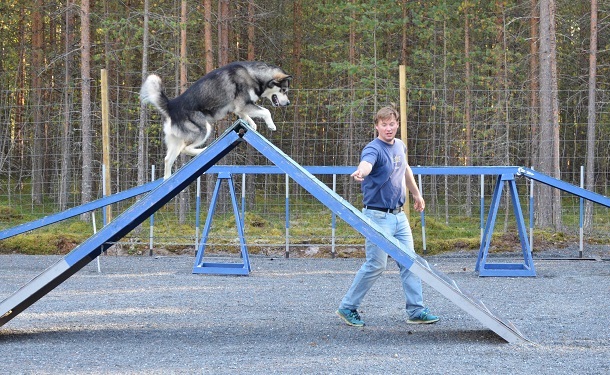 The main challenges during 2014 will be to conquer the weave poles and the teeter-totter. Hilary is fairly confident with the other obstacles so during next year the focus will be on the hardest parts. 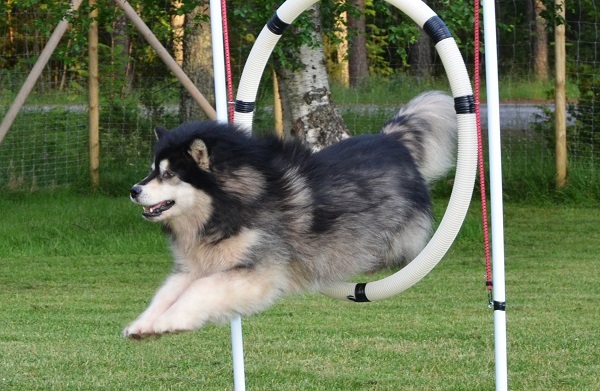 Leia, who turns 9-years-old in February, loves the speed and brainwork required in agility and we will continue her training as a way to keep her mentally and physically stimulated also as she gets older. 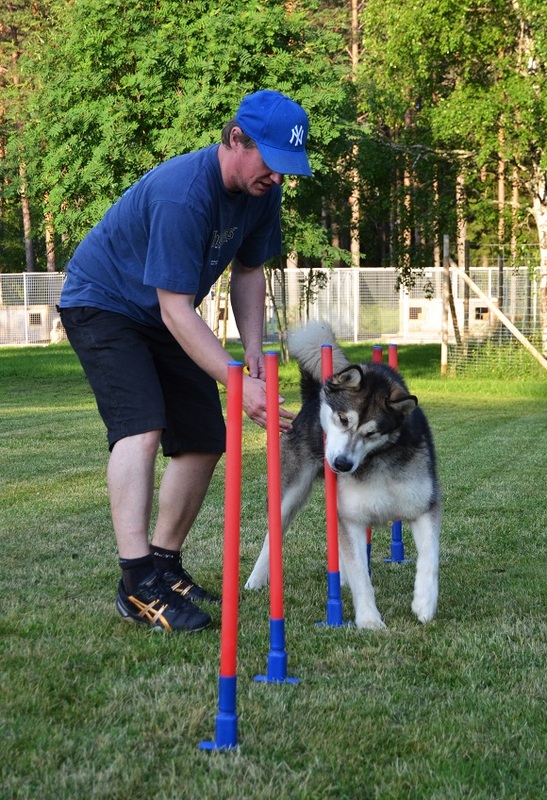 During 2014 we will introduce some more obstacles and focus on mastering the weave poles once and for all – she’s a very clever girl so we know she can do it! 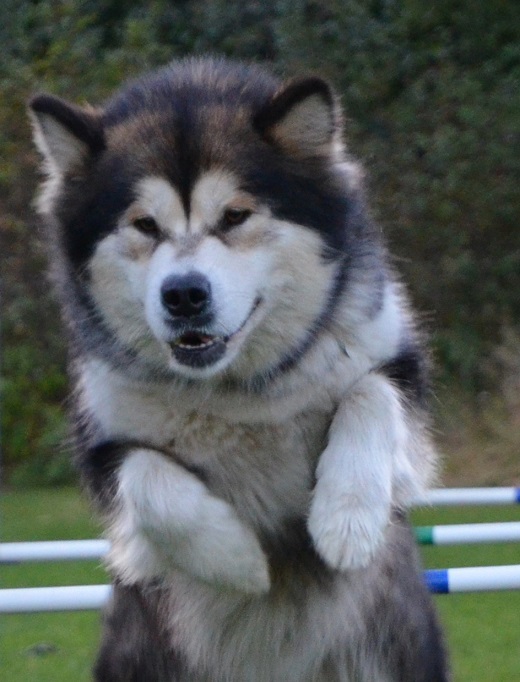 As you can see in the video, Wilder jumps even when there is no obstacle to jump LOL! 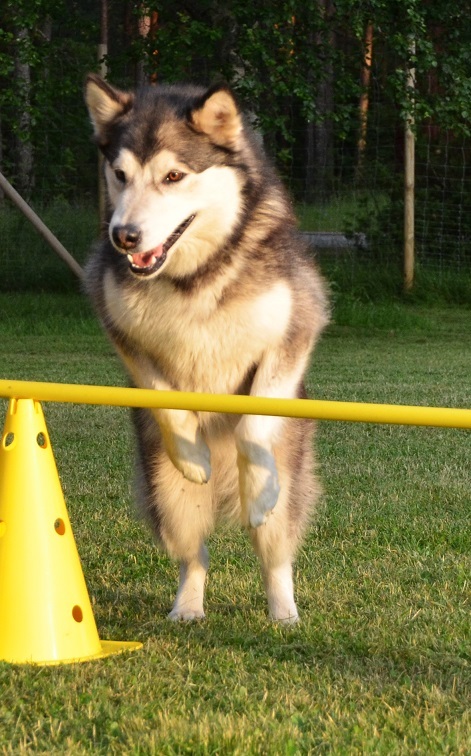 Hilary during the summer of 2013 – Agility is fun!!! 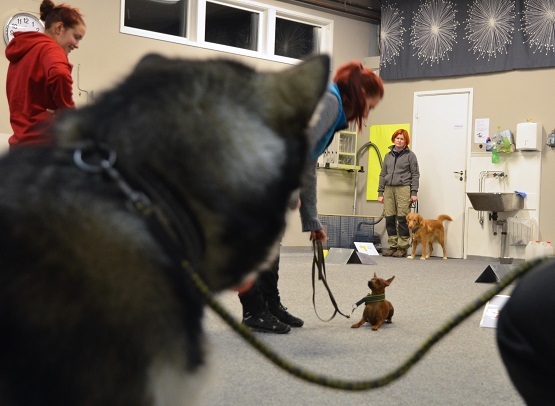 Heeling is the most important element of Rally Obedience and since this is our weakest skill I have decided to go back to basics and start out by working on our dogs’ rear end awareness which is the key to straight sits, backing up, pivots and maintaining heel position etc. 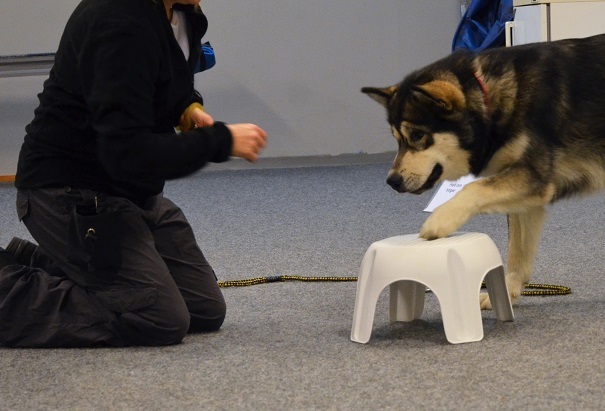 To improve Wilder’s rear end awareness I brought a plastic step stool to our Thursday training. 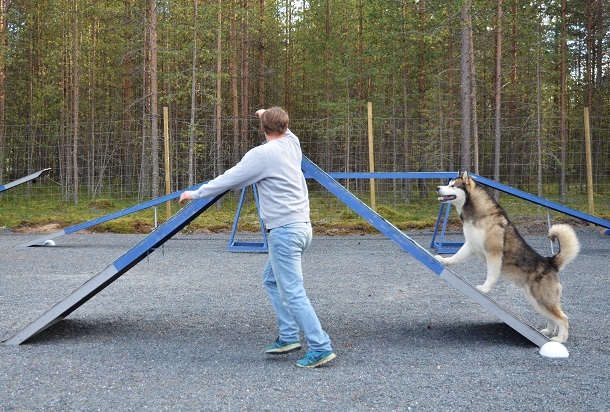 The step stool could be replaced by a book, a frisbee or any kind of low platform that is stable and that your dog is comfortable putting his feet on. 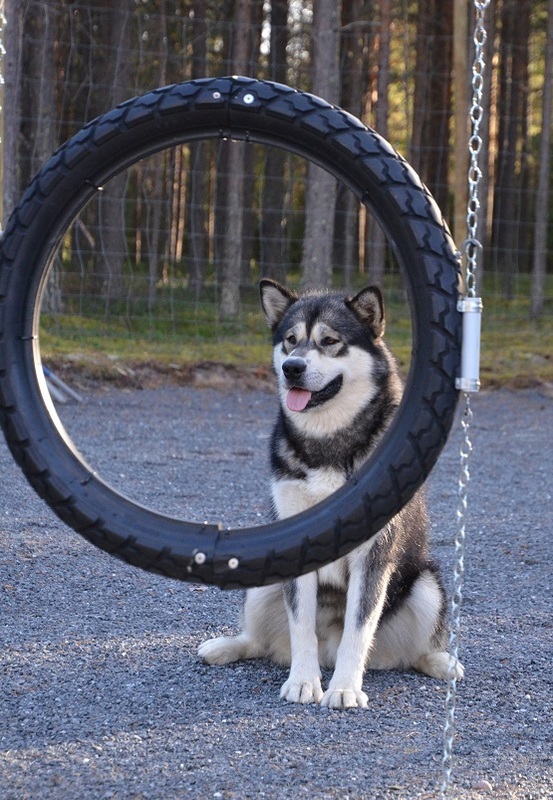 I prefer a square object to a round object but when you start the training the shape is not so important, as long as the dog is comfortable with the object. 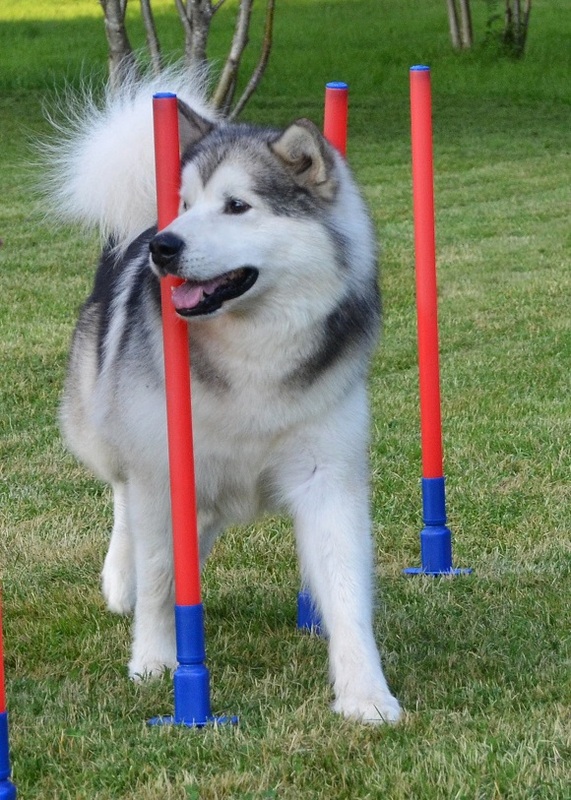 The goal of this exercise is to teach Wilder to place his front feet on top of the step stool and remain in that position while following me with his rear legs when I move around the step stool in a circle. When starting out with a new dog, the exercise is broken down into many separate skills and yesterday’s goal was simply to get him to touch the step stool with his paws. To make Wilder more clicker “aware” and encourage him to offer behaviours freely, I’m using the shaping technique. This means that I avoid showing him what to do and instead wait for him to do some creative thinking. Every small step in the right direction is rewarded with a click and a treat. I started out by placing the step stool on the floor and waited to see what he would do. I had the clicker ready in my hand and plenty of yummy treats in my pocket. 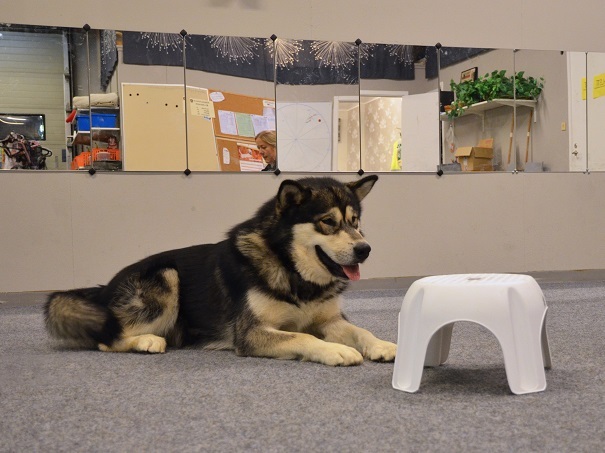 In the beginning, Wilder didn’t understand that the step stool had anything to do with the exercise, so instead he tried to sit and lie down a few times. I ignored his attempts while waiting for him to show interest in the step stool instead. 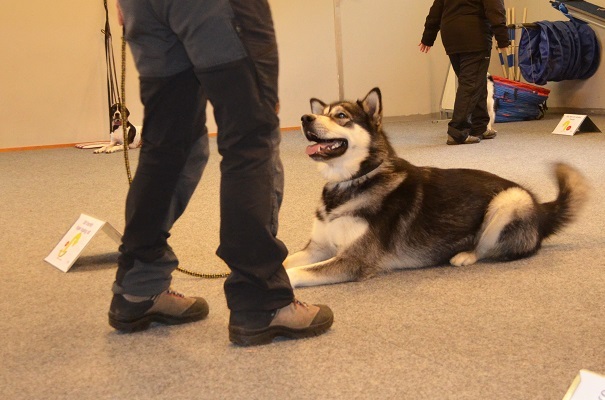 Many trainers will click and reward the dog as soon as he looks at the object, however, since I think it’s easy to miss a quick glance, or reward the dog when he is in fact looking at something else (which could easily cause confusion), I prefer to skip this step and only reward direct contact. When realising that sitting or lying down didn’t lead to any treats, Wilder walked up to the step stool and sniffed it. This was immediately rewarded with a click and a treat and I let him do this quite a few times (i.e. 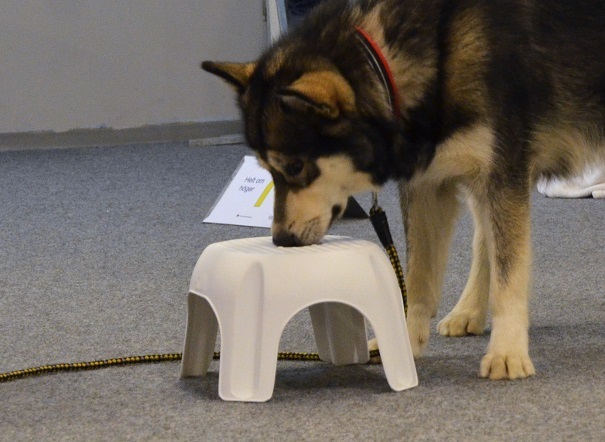 sniffing the step stool equals a click and reward) to build confidence with the object and the exercise. After every successful attempt I threw a treat away on the floor, to encourage him to go back and find the step stool from different directions. This exercise took about 10 minutes from start to finish. When Wilder was offering the desired behaviour consistently, I increased the difficulty level by expecting him to put his feet on top of the step stool. This time, to make it a little easier, I mixed shaping with “luring”, and tapped the object with my fingers to show him what I wanted him to do. As soon as he touched the step stool with his paw I clicked and rewarded him with yummy treats. 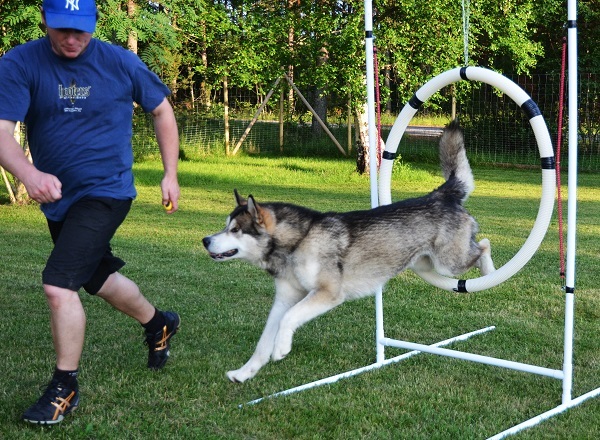 It took about 5 minutes from start to finish until he put his paw on the target for the first time. Once Wilder knew what to do he was very quick to place one paw on the step stool, run away to get his treat and go back to paw the step stool. 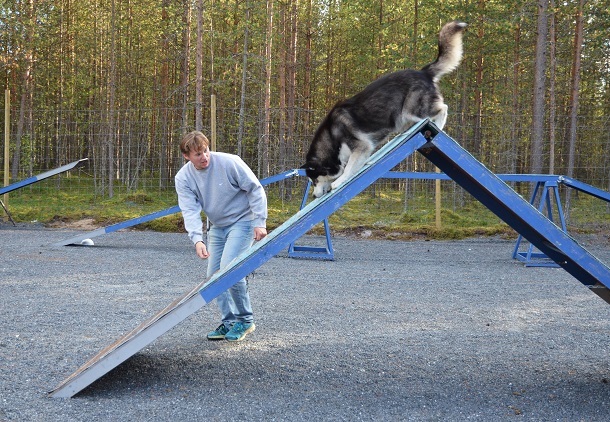 I decided to end the exercise there, as I felt that it would be too much to ask him to put both feet on the step stool during the first day of training. Instead, that will be the goal of our next training session. 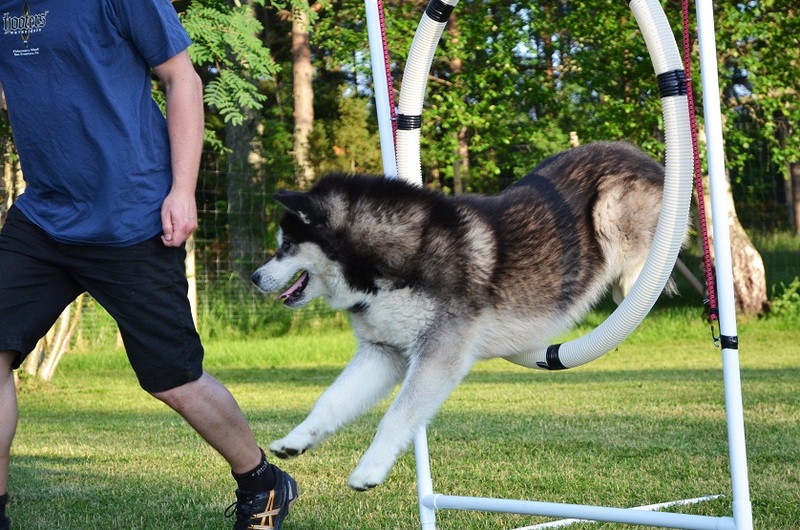 As I mentioned earlier, the goal is to teach Wilder to pivot by keeping his front feet firmly on top and moving his rear legs around the step stool in a circle (left and right). When this is accomplished, I hope to be able to teach him how to find the correct heel position himself and remain in this position while I rotate my body around. I’m going to do this step-by-step and will keep you posted about our progress. This is the first time I try this technique so I will probably be making some mistakes along the way, but hopefully Wilder will be making pivots before the end of the year (considering that our training sessions are limited to once or twice a week). 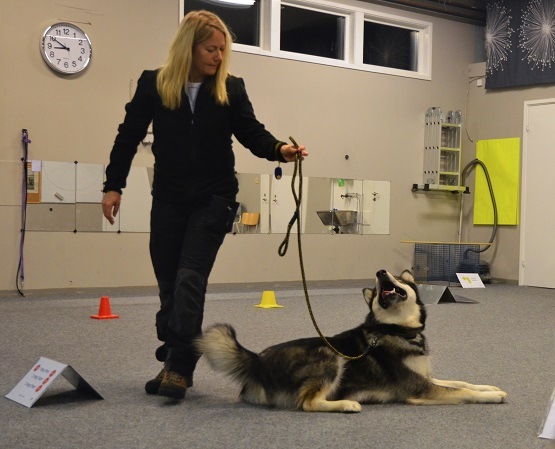 Since quite a large amount of treats is consumed during a clicker training session I think it’s important to use treats that are good for your dog (or at least not bad for them). 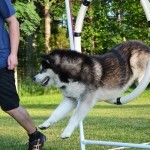 Our Malamutes love Orijen Treats which make very good high value rewards for a big dog when split in half. 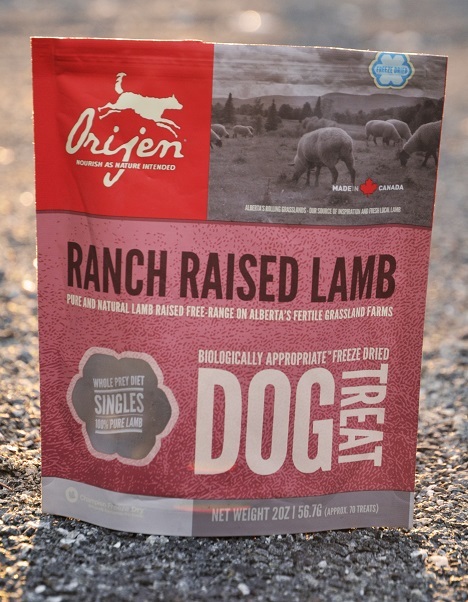 Orijen Treats are preservative free, low in calories and carbohydrate free and there are many different flavours available. For yesterday’s exercise we used Ranch-Raised Lamb. Yummy! To beat the autumn blues we make sure to keep busy eight days a week! 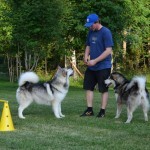 Yesterday evening we took Wilder and Titan to the dog club for some indoor rally training. 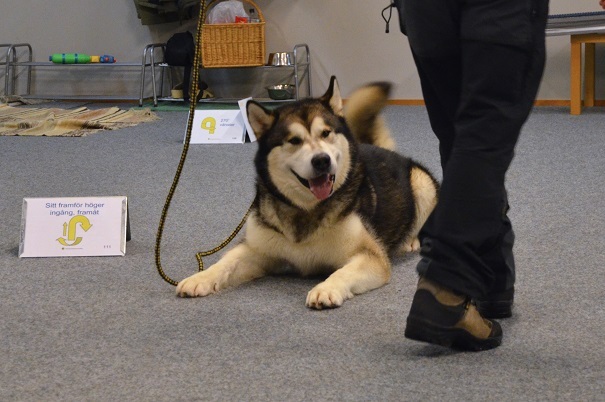 As it turns out, our dogs are not the only Malamutes at the club; yesterday a sweet 7-year-old girl called Nala joined the class too. Fun! Our own training didn’t go super yesterday, the focus wasn’t there and the execution was more than just a bit sloppy. 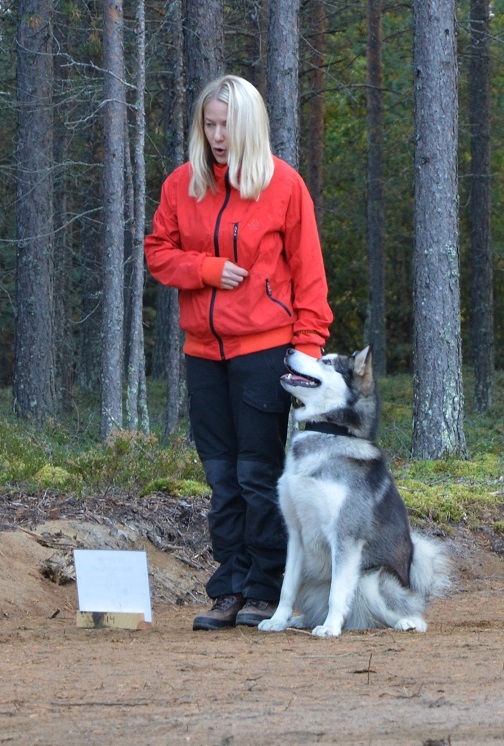 As we continue training we need to increase the reward criteria gradually and wean our dogs off the treats. But for now the main thing is that we’re having fun and that they feel confident in their work. 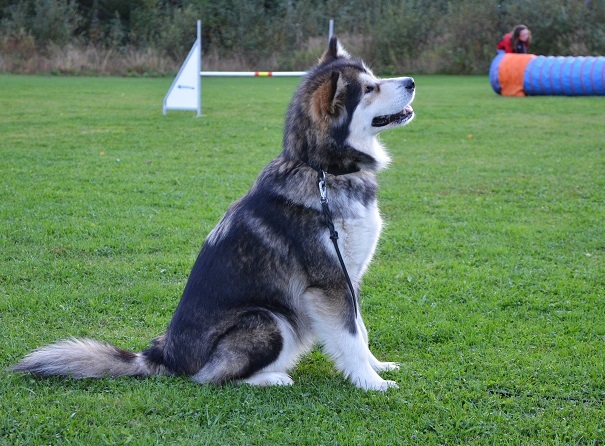 For a 4-year-old dog that has never done any type of formal training (apart from the obedience training we integrate in our harness work) Titan did well and his tail was wagging non-stop! As you can see, I’m holding the leash in my left hand. This is not ideal for rally training but a bad habit that I have. By taking photos during training I notice my mistakes and can correct them. 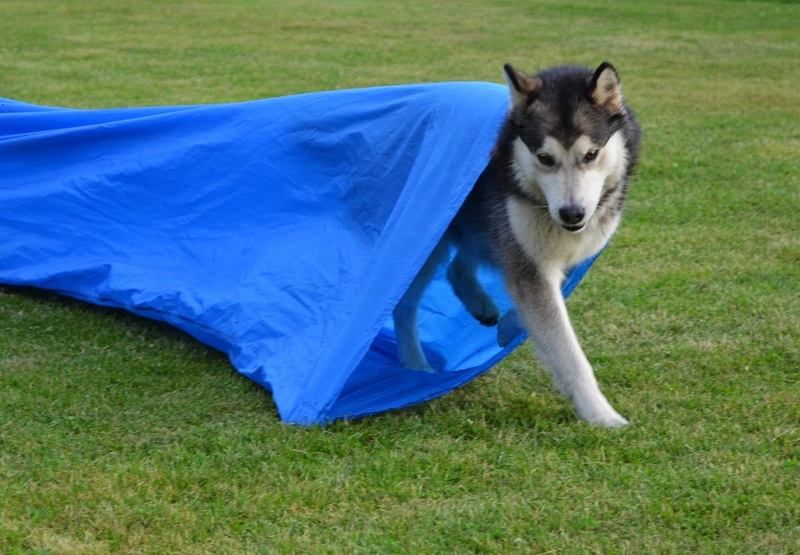 Here, for example, I should have started out with my left leg, not the right, as I wanted Titan to follow me. 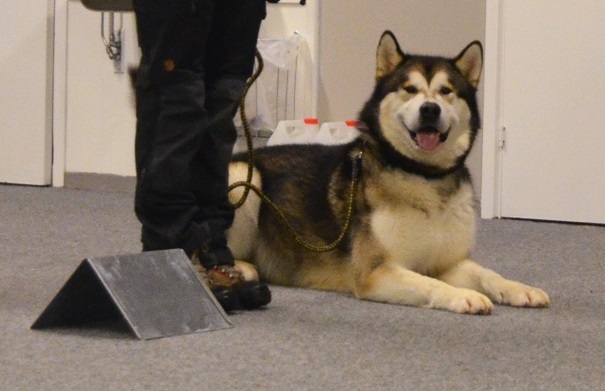 Titan surprised us by nailing the station “Down and walk around your dog” at his first attempt. 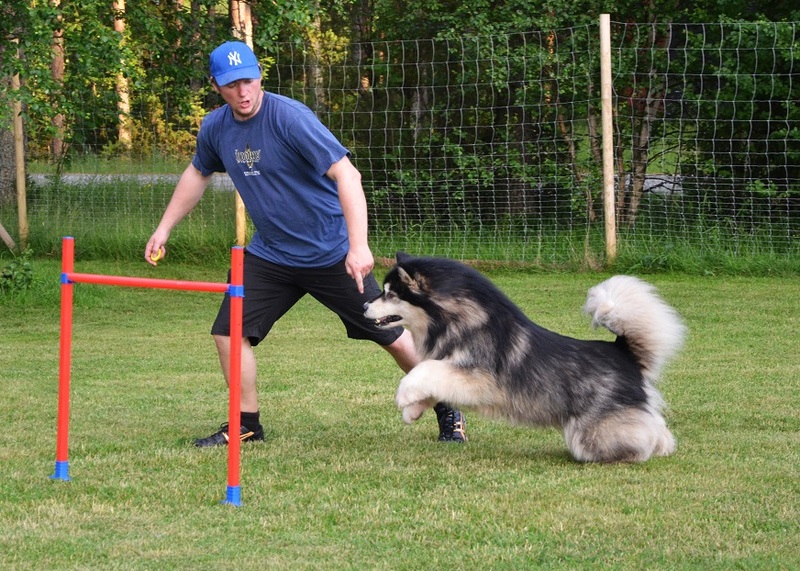 The weave cones were harder, probably because he is a large dog and my handling was pretty poor. 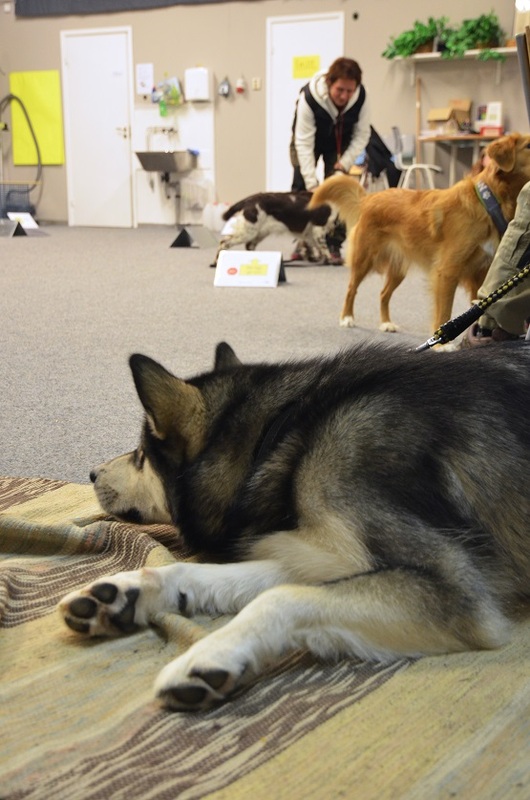 An important part of training is learning how to wait patiently while the other dogs are having fun. Wilder kept a constant eye on me during the “Down, and walk around” exercise. 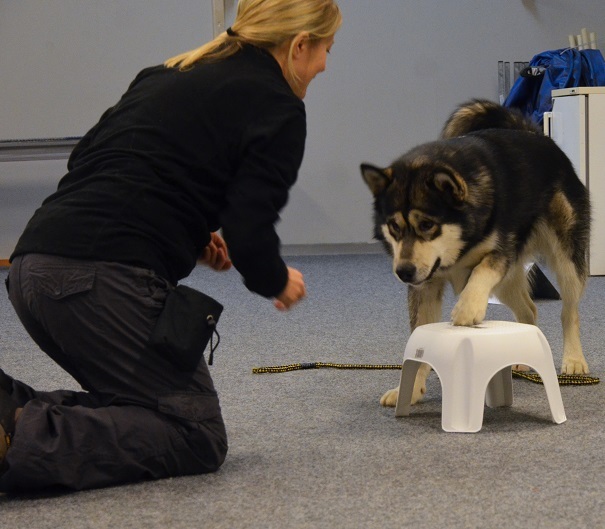 He’s making good progress at the static exercises (sit, down and stand) but struggles with his heelwork. 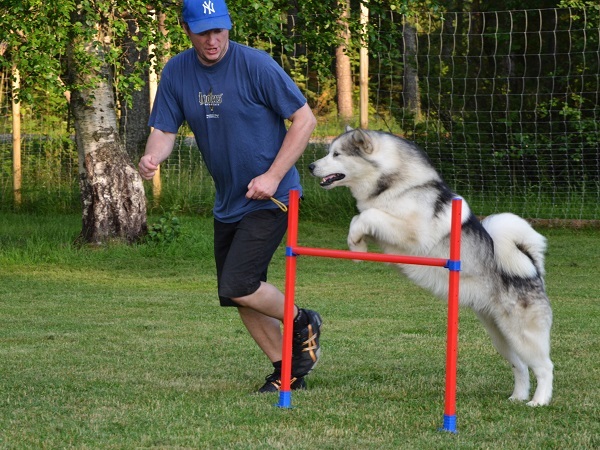 In fact, I think all our dogs struggle with heelwork and since Rally-O is all about moving smoothly on a loose leash, this is something that we really have to work on. Oh no, the leash is in the left hand again! …and after two hours 😉 Nothing beats Rally Obedience in making a Mal tired! 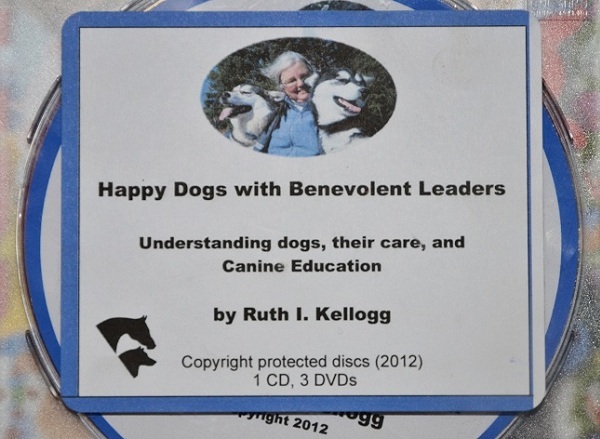 Every time I struggle with training I return to Ruth Kellogg’s excellent work “Happy Dogs with Benevolent Leaders” published in 2012. 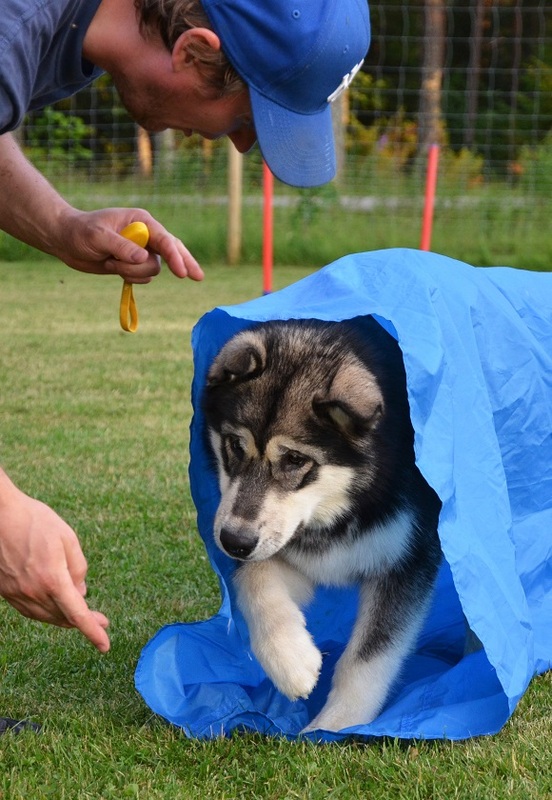 This CD-book is made up of 900 pages jam-packed with detailed and practical advice on everything from daily Malamute care and pack management, to building the foundations for formal training. 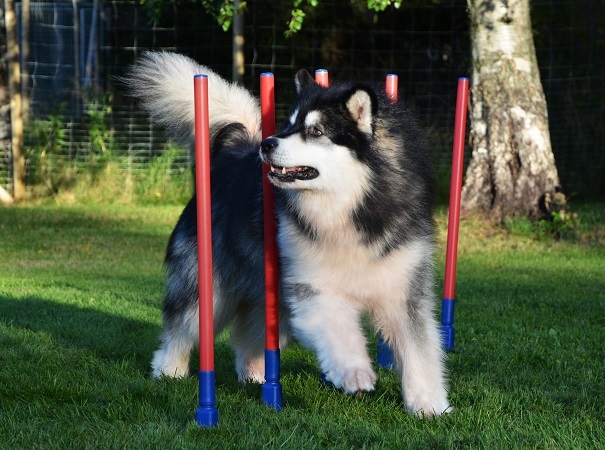 In the three accompanying DVDs, Ruth and her Inharmony Malamutes (ages ranging from young puppies to adult dogs) demonstrate in videos how to introduce and train all the foundation skills needed for sports like rally, obedience and agility. 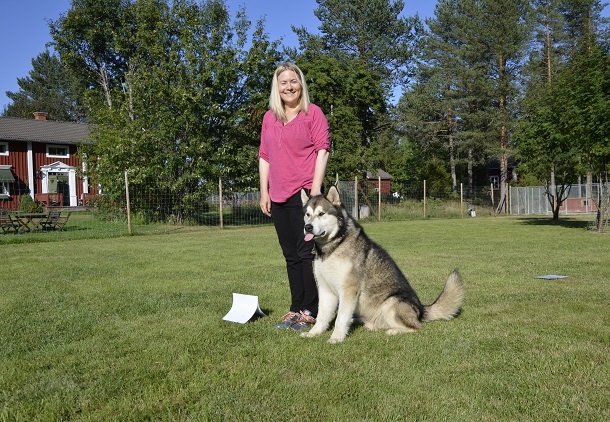 I find her work very inspiring, not the least because she is a Malamute trainer and most other authors of dog training books are not. Before we re-start our heel training, I’m going to re-read the chapter about Precision Heeling and watch the accompanying video on Disc #2. I’m certain it will put me right back on track! That pretty much sums up October here on the northern coast. 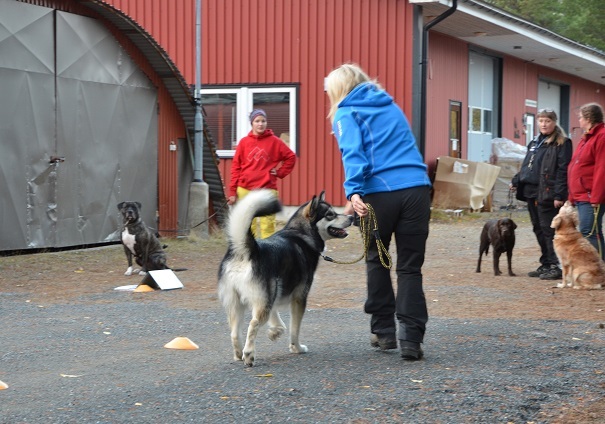 While waiting for snow and winter to arrive we keep ourselves and the dogs busy by attending training sessions at the dog club and going for runs with the wagon or bicycle. 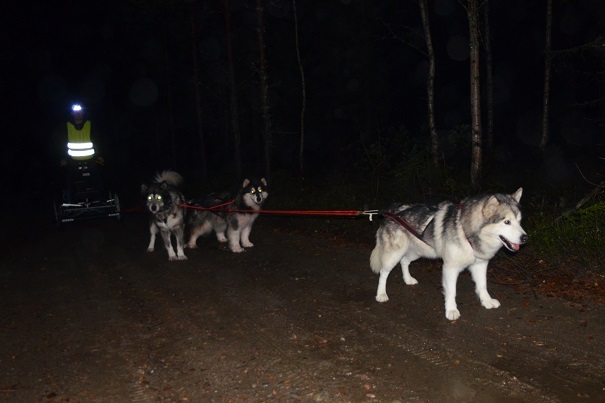 When working the dogs in the evenings we use a dead-end forest road that has a locked barrier at the start, that way we can be certain not to encounter any traffic. Occasionally an elk or two cross the road but they always see and hear us long before we see them. 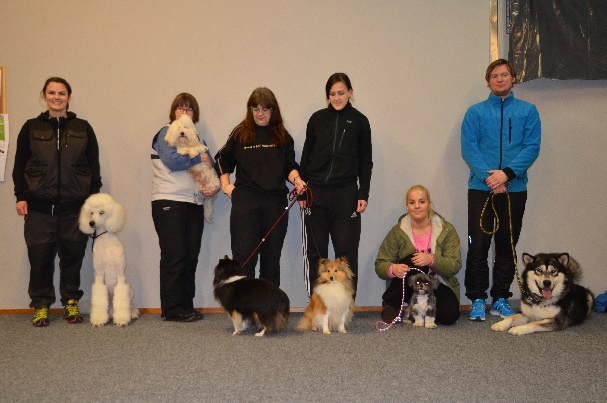 A couple of times each week we go to the club to train together with other dog owners. In addition to the regular training sessions we have joined a group that specialises in rally and trains with the goal of becoming competitive. 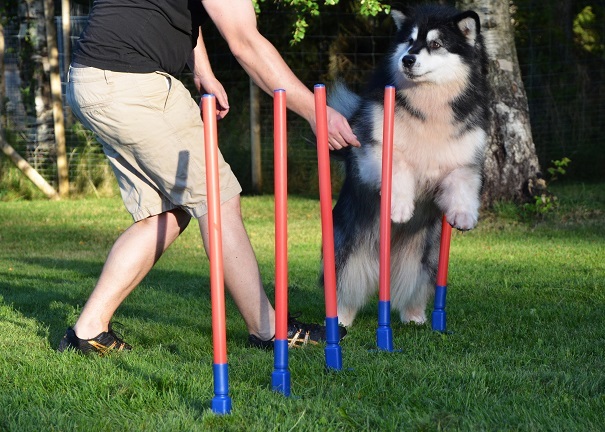 If things go well maybe we’ll be able to enter a dog or two to some competitions next year. 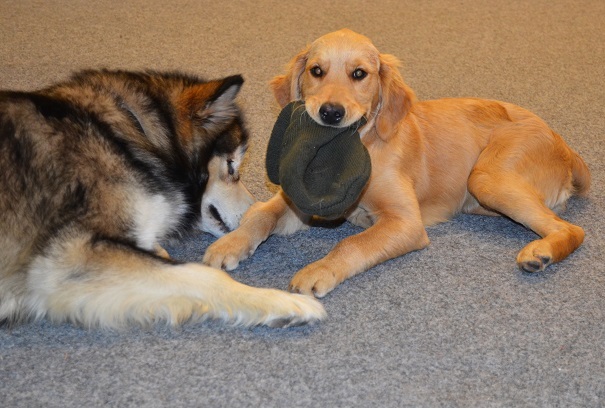 Hilary made a new friend at the club – a 4-month old Golden Retriever girl whose owner had brought her along for socialisation. 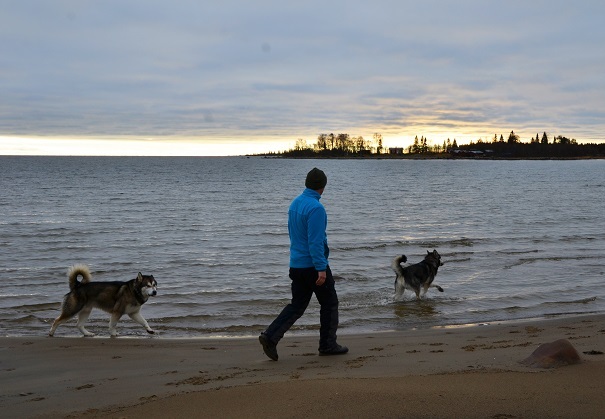 In the weekends we go for long walks to soak up as much daylight as possible. 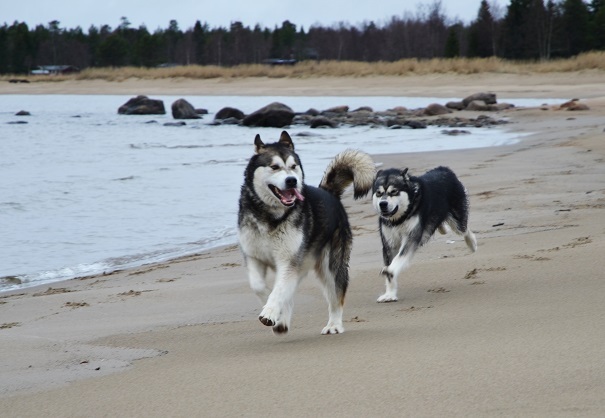 Titan and Wilder love to run back and forth on the beach and in and out of the cold water. The sun sets early in the afternoon and it usually gets dark before we are back home. The boys looked a tiny bit tired after their romp on the beach. 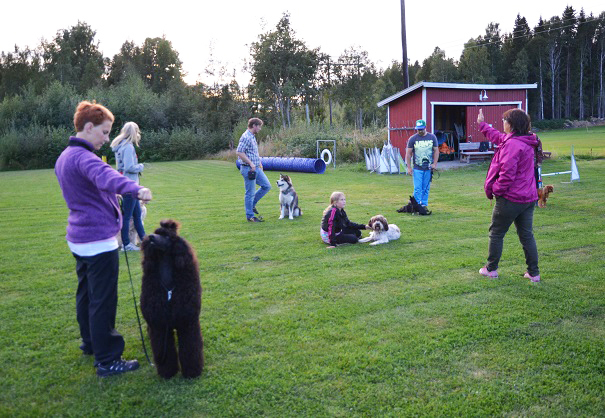 It’s early October and the days are quickly getting shorter so we are very happy to be able to train our dogs at the Åbyn-Byske Brukshundklubb’s indoor facility a couple of times each week. 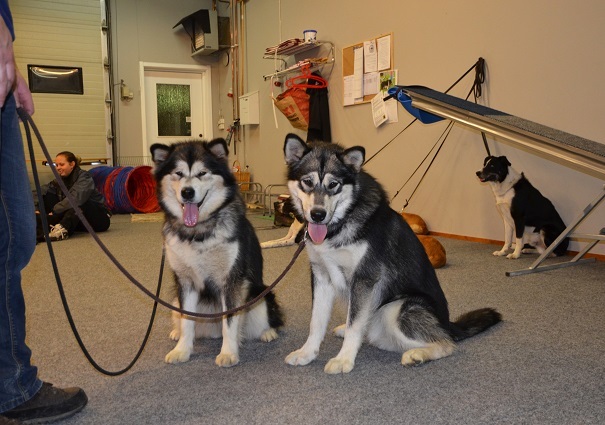 Yesterday we brought along Titan, Wilder and Hilary for an evening of weight pull, rally and agility training. 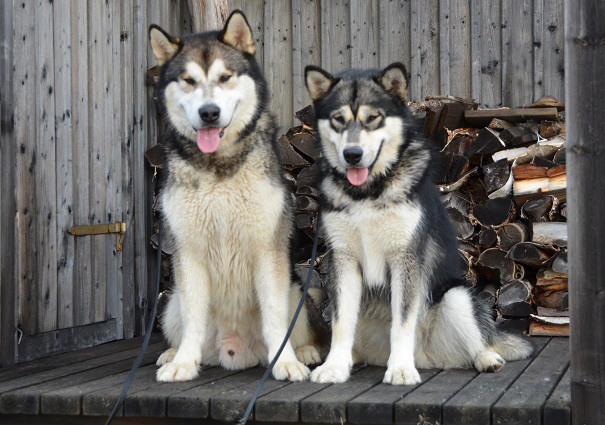 Fredrik and Titan joined the weight pull section while Wilder and I started out by training Rally-O outdoors. 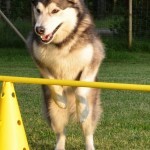 Later on in the evening we all went indoors to work on agility with Hilary and do some relaxation training with the boys. 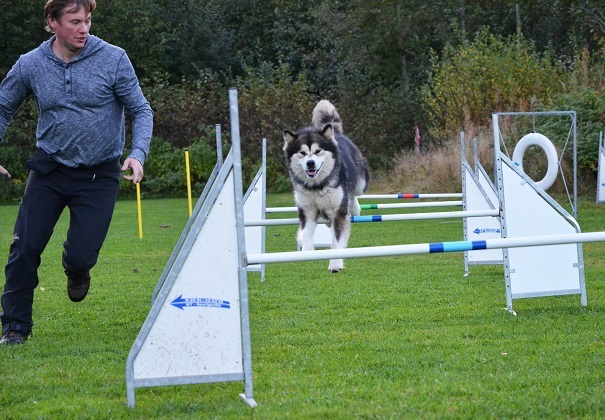 On Thursdays the club has “open training” which means that there are plenty of people and dogs around and the busy environment is perfect for off leash obedience training and to encourage relaxation afterwards, in the company of all the other dogs. 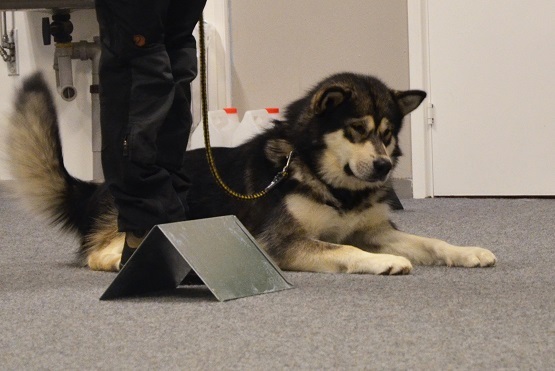 This was Titan’s first indoor session so we started out by letting him take in the new surroundings. 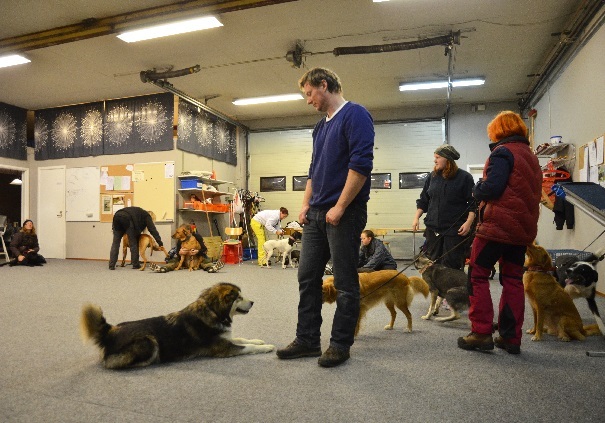 Wilder has been to indoor training once before while this was Hilary’s first visit to the Åbyn-Byske Brukshundklubb. 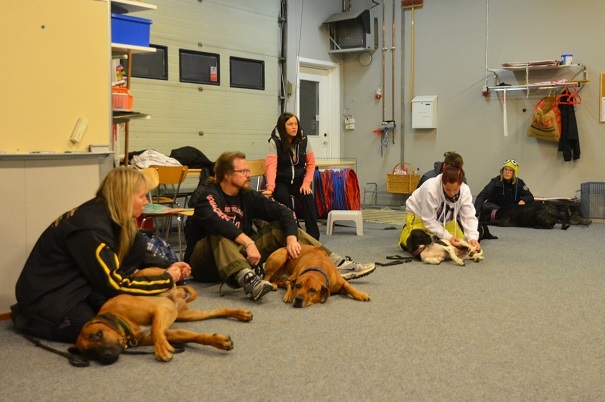 A whole new place with plenty of new people and dogs – it’s useful to change environment now and then as it adds an extra dimension to the training. 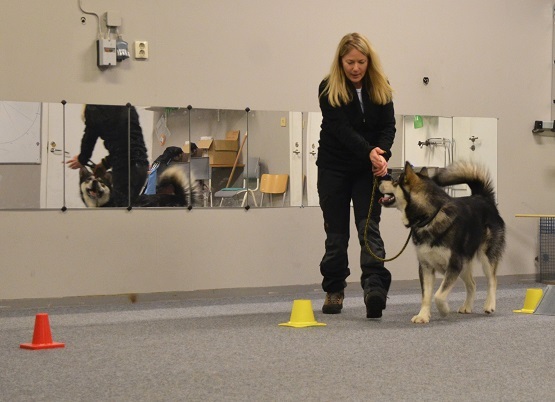 Fredrik and Hilary started off by practising down-stay in the busy room. 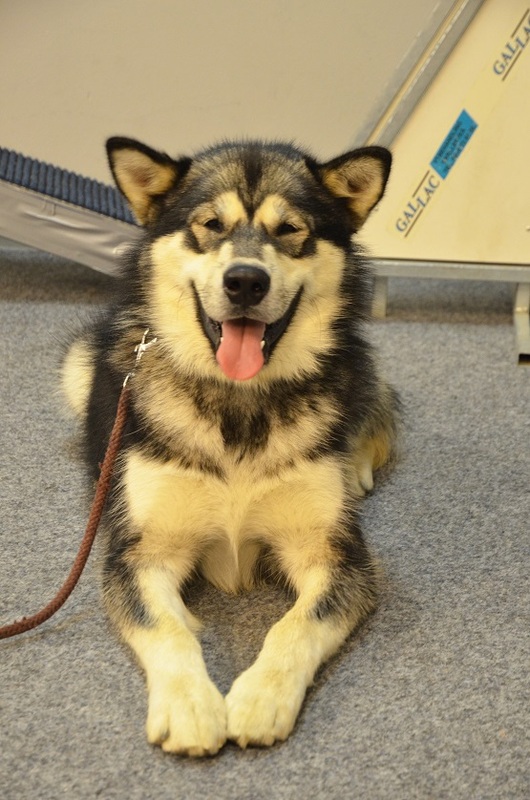 Hilary is still very keen on visiting people and dogs but has made great progress during the summer. 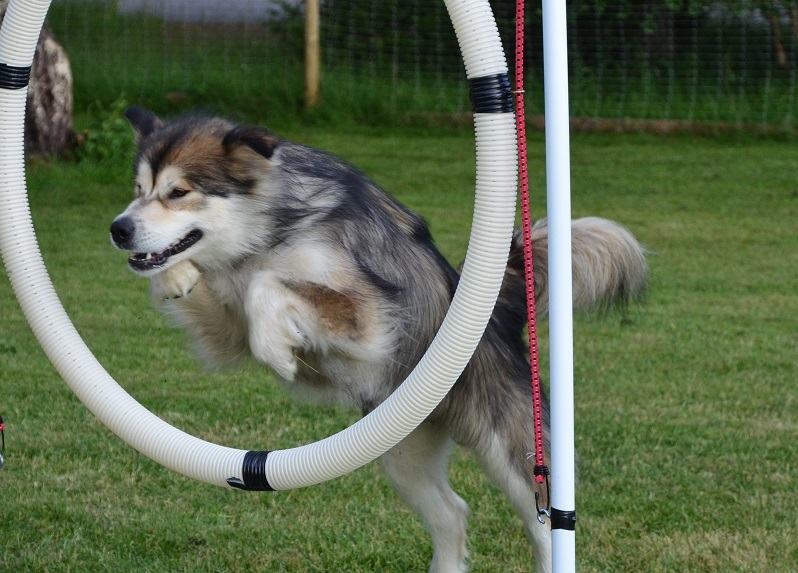 At the agility course she is usually fully focused on the task. 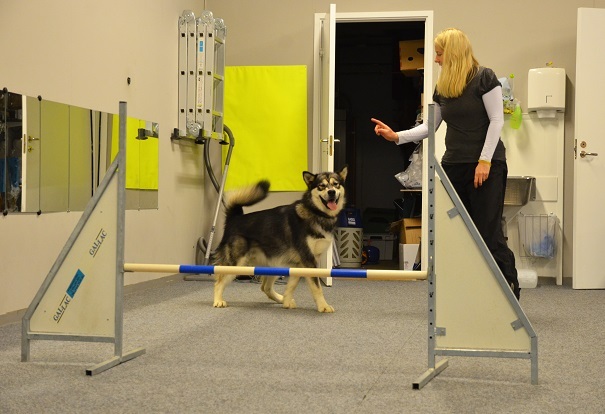 Wilder too tried his paws at agility and did really well ignoring all the distractions in the room. 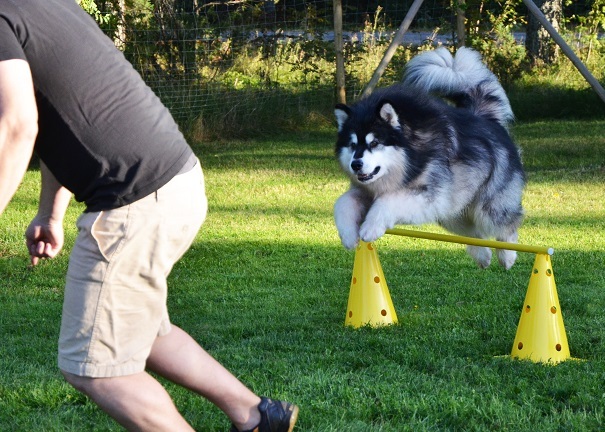 We set the bars low since he’s still a puppy and shouldn’t be doing too much jumping. 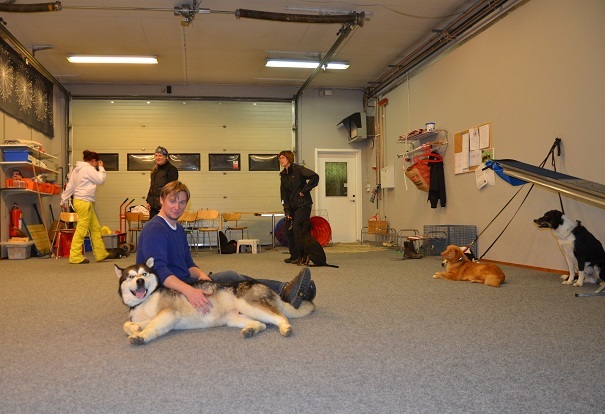 The weight pull section usually ends their training sessions with indoor relaxation and massage and their dogs were lying just next to us when we were doing jumps. 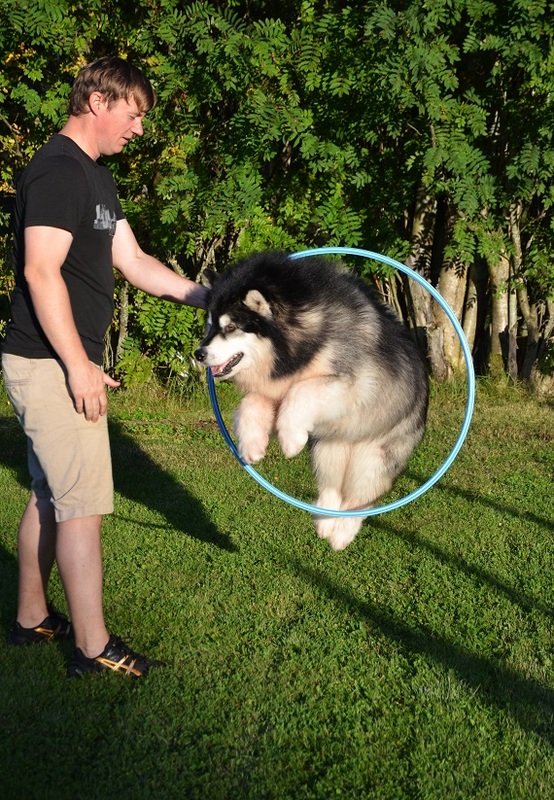 Clearly they have been trained well in the art of relaxation as three flying Malamutes did not bother them one bit. 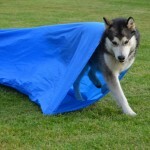 Our training evenings are great fun, for both us and the dogs. 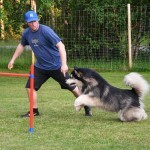 In fact, joining a local dog club to train agility, rally-o, obedience, weight pull etc. 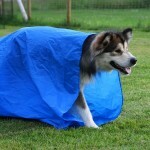 is something I would recommend to every Malamute owner. 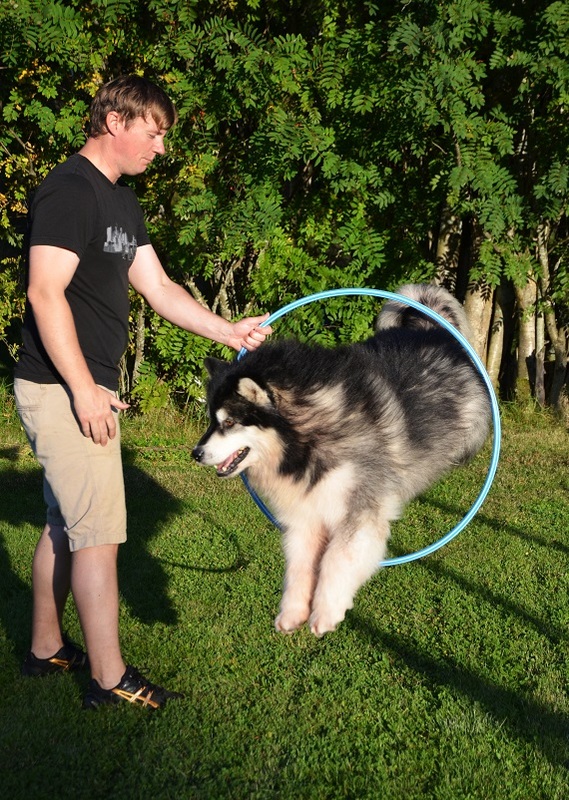 There are so many fun things, besides sledding and showing, that you can do with your dog(s), that will both strengthen your bond and keep your Malamute physically fit and mentally stimulated. Honour the breed’s amazing versatility and try something new this autumn – I promise you won’t regret it! 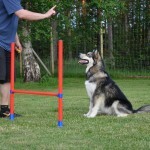 Lyra and Hilary’s Rally Obedience and Agility classes continue on a weekly basis and both girls – and their handlers – are making good progress. Some of the elements that seemed complicated and hard at our first sessions have turned out not to be so difficult, while other elements will take a lot of practice to get it right. 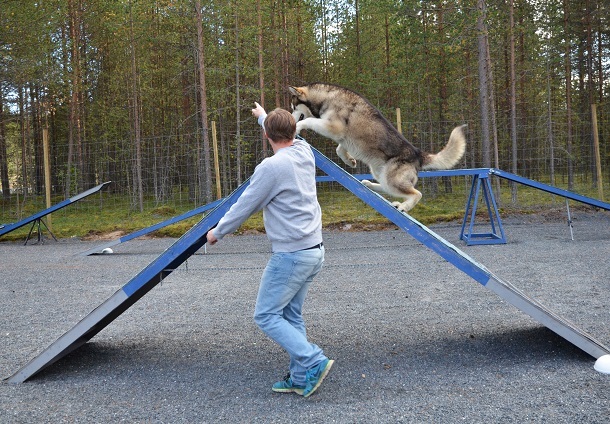 Fredrik and Hilary have been introduced to all the agility obstacles apart from the teeter-totter and so far the weaves is their biggest challenge. 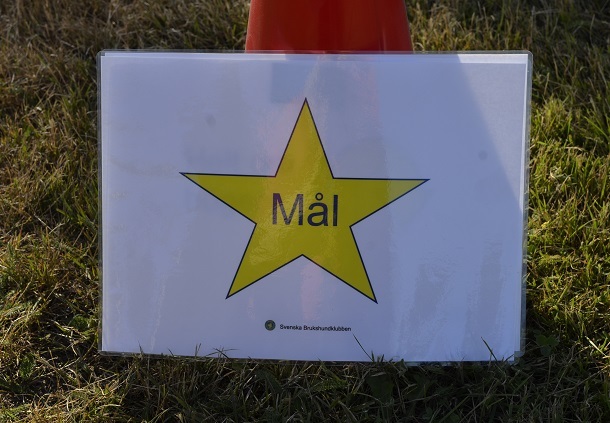 At Rally-O, Lyra and I have attempted 20 of the 30 signs that make up the Rally Novice class in Sweden and it’s obvious that we have some work in front of us when it comes to improving our precision and smoothness. 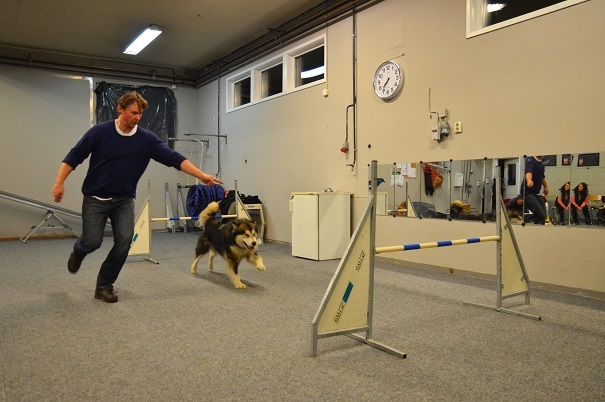 I think both Fredrik and I could easily get bitten by the training and trialling bug, as this is great fun! 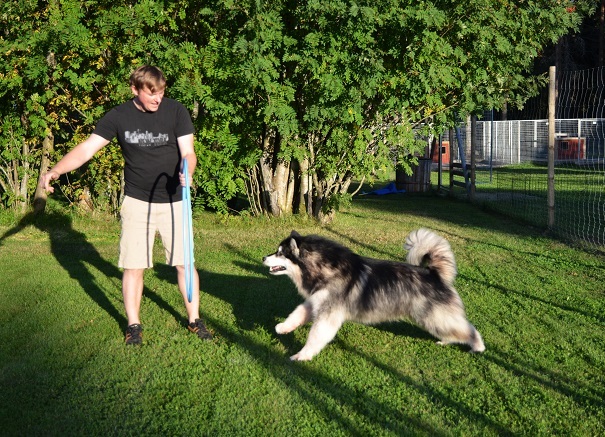 However, one disadvantage of having multiple dogs (in our case 8 dogs) is that we do not have the time to become really specialised in individual sports, as we need to make sure that all our dogs get their fair share of attention and training. But we will definitely make the most of our classes this autumn and the girls are having a blast! The A-frame is a walk in the park for Hilary as she loves to climb on top of things. The jumps are still her favourite obstacles but we’ll have to improve our “send away” technique. And while balancing on things is fun, we have to make sure that she doesn’t miss the contact areas by running too fast across. 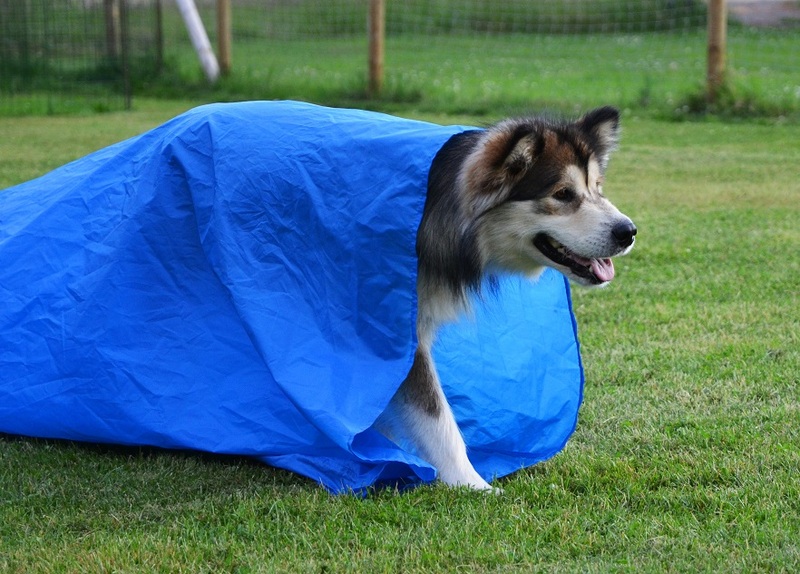 Rally-O is all about establishing great teamwork with your dog through positive training. 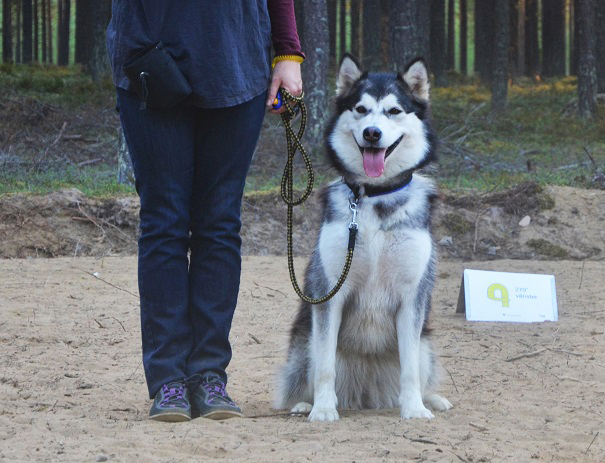 One of the most important skills your dog needs to do well is the ability to walk on a loose leash – as a tight leash, even if it’s just for a moment, will deduct points from your score. 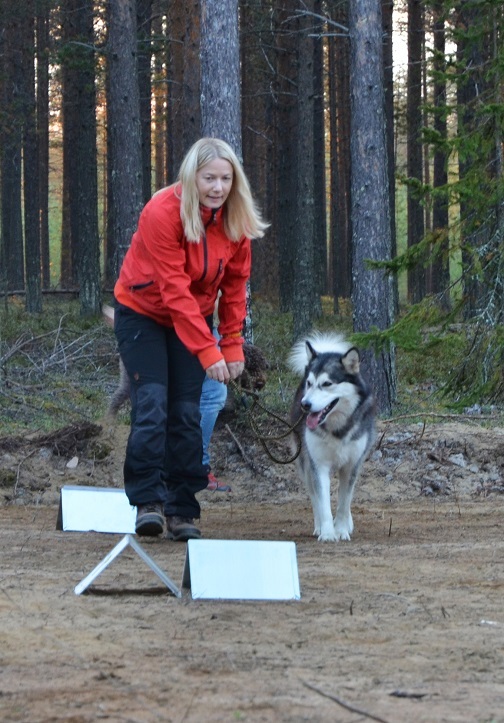 What I particularly like about Rally is that you are allowed and encouraged to talk to your dog throughout the course to keep him/her happy and interested. 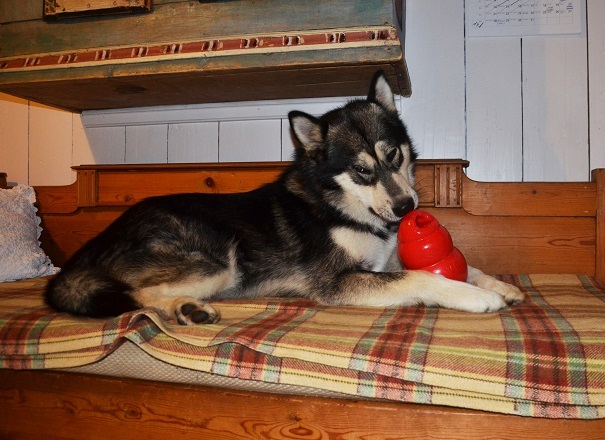 As you can see in the photos, I use a lot of verbal cues (and yummy Orijen Treats!) to keep Lyra alert and on the ball. In fact, I probably talk too much and should focus more on developing a more effective body language. We are already looking forward to next week! Hilary and Lyra have turned two years old during August so we thought this autumn would be a good time for them to go to school and learn something more than just the basic training that we do at home and in our everyday life. 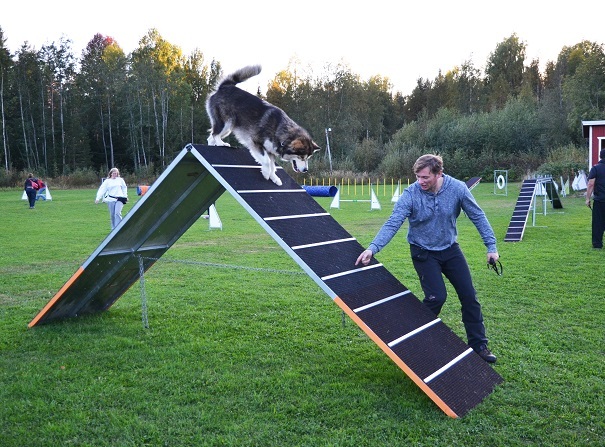 Since Hilary loves to run, jump and climb, agility was the first sport that came to mind. 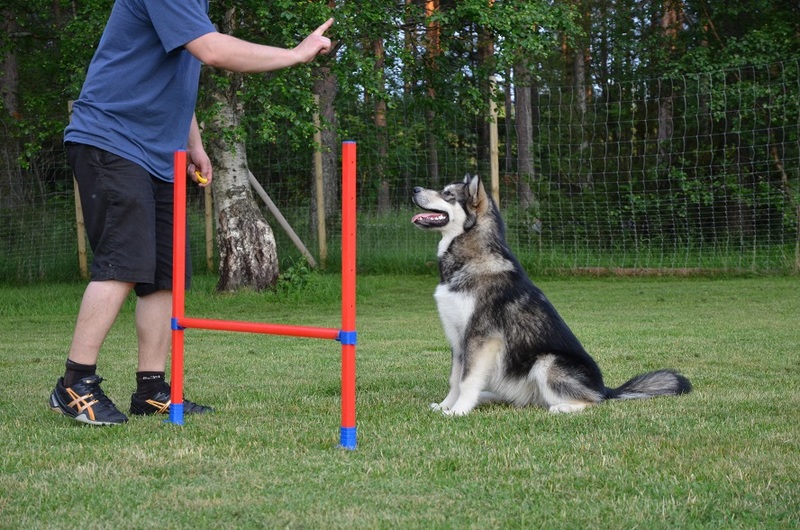 Lyra, on the other hand, enjoys close teamwork and needs more mental stimulation so we decided that rally obedience would be a good challenge for her. 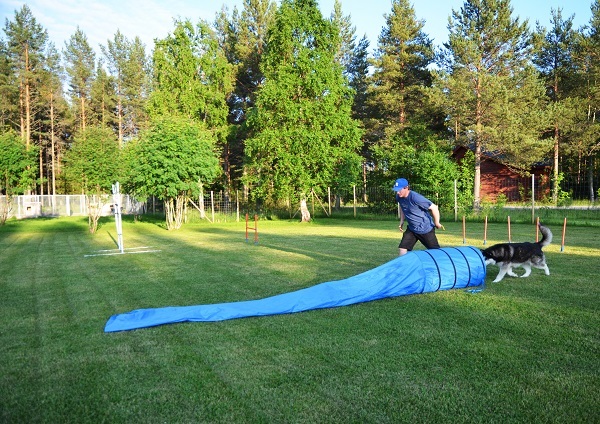 Hilary and Fredrik took part in their first agility class last week while Lyra and I went to our first rally-o session yesterday evening. 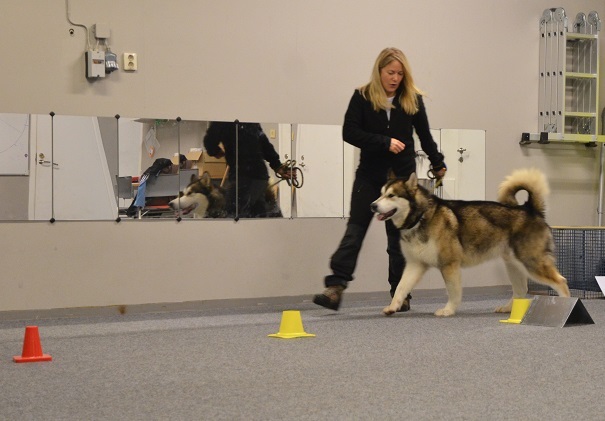 Considering that neither Hilary nor Lyra have been to any classes since they were puppies I think they both did really well and it looked like they were having FUN! 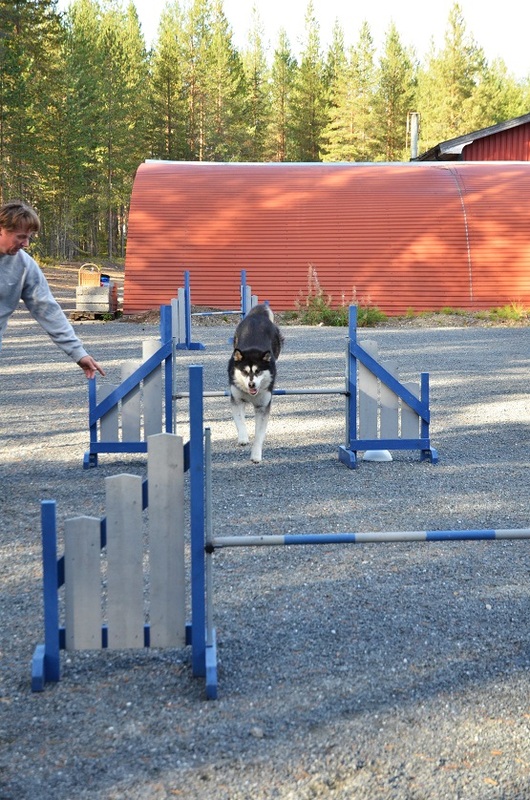 Fredrik and Hilary tried out the weave poles and some jumps at their first class. One of Hilary’s biggest challenges will probably be to resist the urge of running up to all the other dogs at class to say hello. 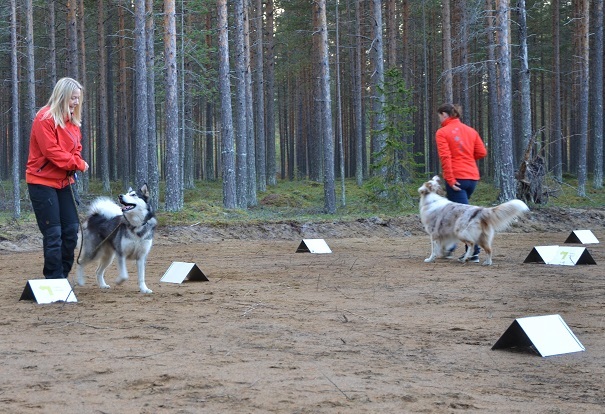 She went on a couple of detours during the first 15 minutes, before she realised that playing with other dogs during class is not allowed. Luckily Hilary hasn’t got a bad bone in her body so if she does run off she won’t cause any major trouble. Did we have fun? I think her smile says it all! OK, so what do you want me to do here? Jump through it? Okay here I come! This was fun, can I try again? 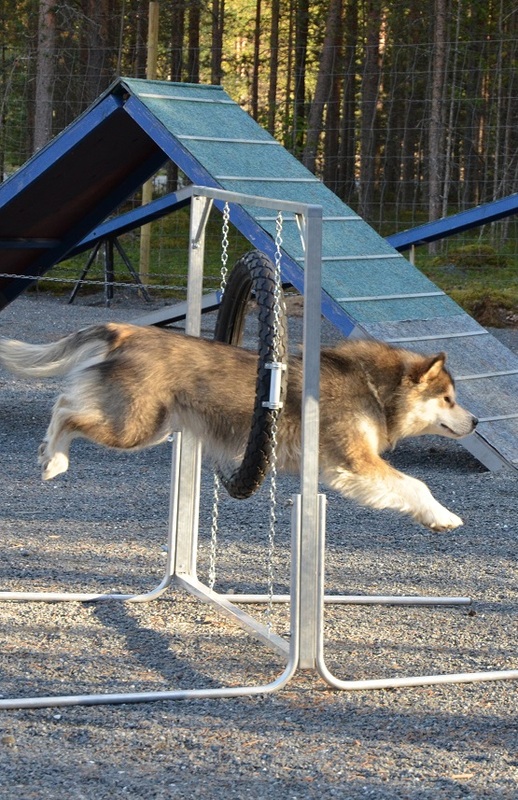 We need to get higher jumps, this one is much too easy for the flying fluff! 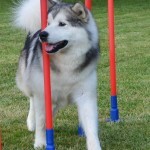 The weave poles are Leia’s favourite obstacle. She can do them super fast! 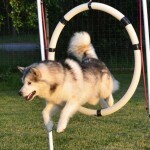 Tip of the day – buy a hula-hoop at the supermarket and have some fun with your dog! 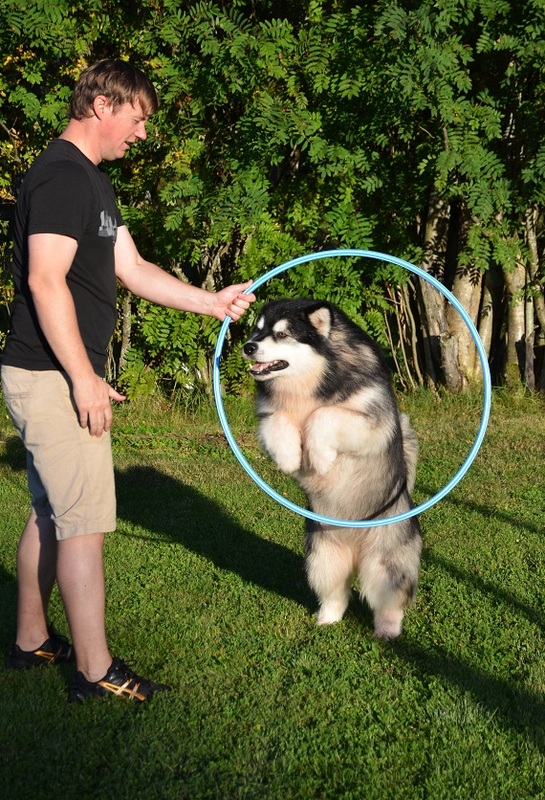 Here are some tips on the tricks you can do with a hula-hoop, your Malamute will love it!